Some sites need more protection than others. That’s why, at Dara, we also offer heavy duty enclosures to cope with the toughest environmental conditions. Proven to withstand the toughest environmental conditions, our heavy duty enclosures are used predominantly in mining sites across Australia. 1.6 mm Mild steel panel boards are used for applications of below 250A and the 2.00 mm series is used for high current applications, providing more space inside and gland plates (surface) area for a high volume of cable management. These panel boards are tough and manufactured from high quality steel, fully welded with the double return enclosure sealing flange that compresses tightly against the premium grade sealing gasket which can withstand compression properties at the highest temperatures. This attention to detail, extends the lifespan and increases the safety of the valuable electrical equipment inside. 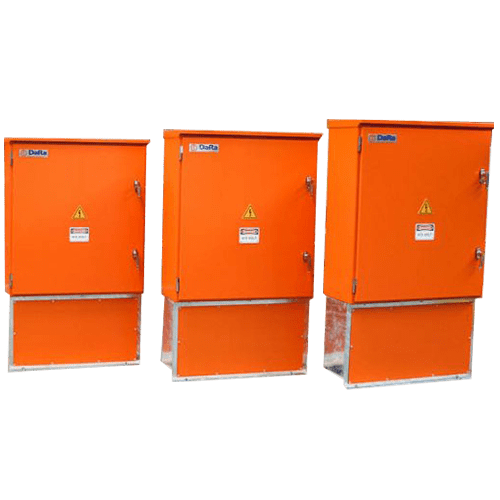 For the toughest environmental conditions, we recommend heavy duty electrical switchboard enclosures. Particularly suitable for mining sites, theses enclosures are NATA tested for its highest IP rating. Enclosures made with 1.0-1.6 mm Zincseal mild steel panel boards are suitable for applications of 250A and below, while the 2.00 mm series is more suitable for high current applications, providing more space inside and a gland plates area to accommodate a high volume of cable management. Our extra-tough panel boards are manufactured from high quality steel and are fully welded with a double return enclosure sealing flange that compresses tightly against the premium grade sealing gasket. This enables the switchboard enclosure to withstand compression properties at the highest temperatures, thus extending the lifetime of the enclosure, and giving extra safety and security to the valuable electrical equipment that’s inside. All our switchboard enclosures have been designed with a wide range of features, that ensure that that they are fit for purpose, practical and can be made to any shape for custom installations. From a lift off door with full height integral door stiffener for extra strength to the brass chrome plated block hinges that allow 180o opening, our switchboard enclosure doors are strong and practical. They also provide the maximum surface area, with top and bottom removable gland plates, and the keyhole mounting holes top and bottom and pre-punched rail mounting system make it easy for the enclosure to be either wall mounted, or floor mounted with the use of a channel plinth. Our switchboard enclosures can be joined together to make any shape for your custom installation. 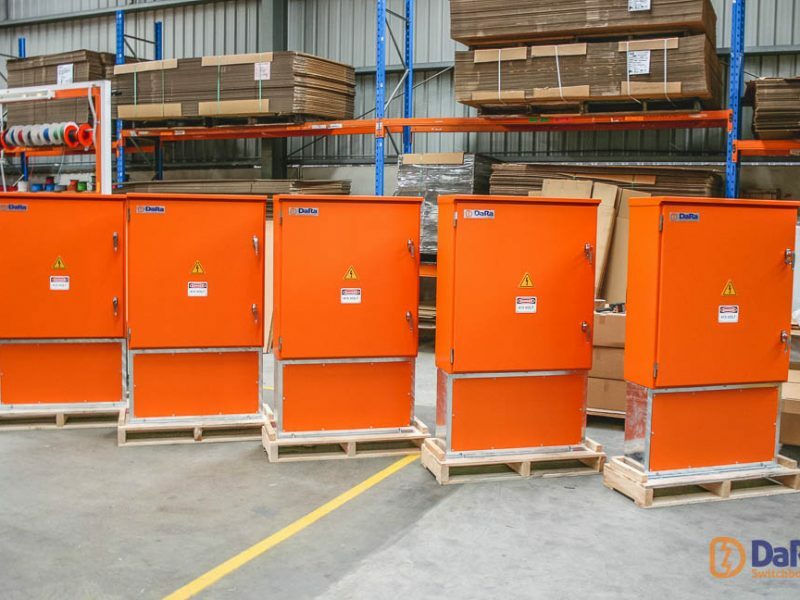 Available in Pastel Grey or Electric Orange powder coating external finish as standard to ensure a superior, long-lasting anti-rust finish, they can also be shaded to your own colour requirements. Other optional extras include aluminium or brass gland plates, door stays, IPA studs on escutcheon, galvanised plinth and stand options, cyclone protection kits, together with a choice of 316 marine grade stainless steel or aluminium construction. To find out more about our custom switchboard enclosures price, get in touch with the team here at DaRa. 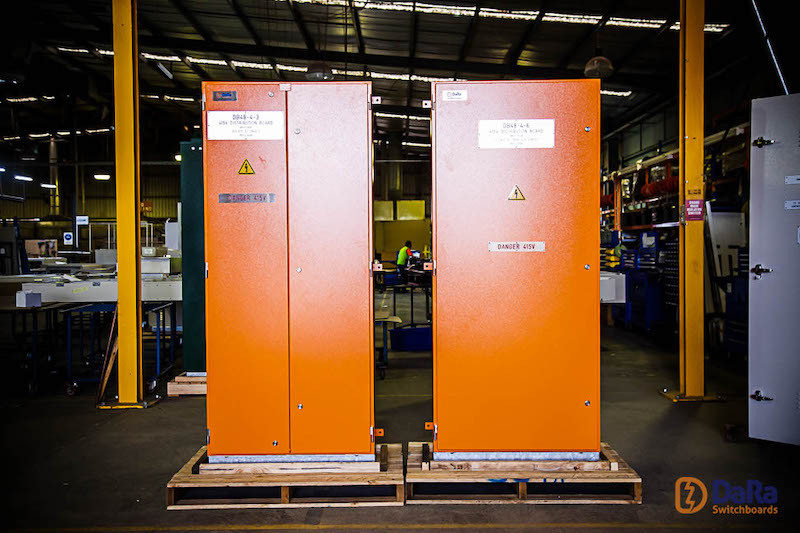 To request costings for your standard or custom switchboard enclosure, or for further information, please don’t hesitate to call our sales and engineering team on 03 8544 3300, send an email to info@dara-switchboards.com.au, or complete our online contact form, and we’ll get back to you as soon as possible.